Camping at Faversham beer festival 2019 will be based at the Abbey secondary school which is a 10 minute walk from the festival site with a regular shuttle bus service running between the 2 points. The campsite has toilets, running fresh water & showers however no power hookup is available. 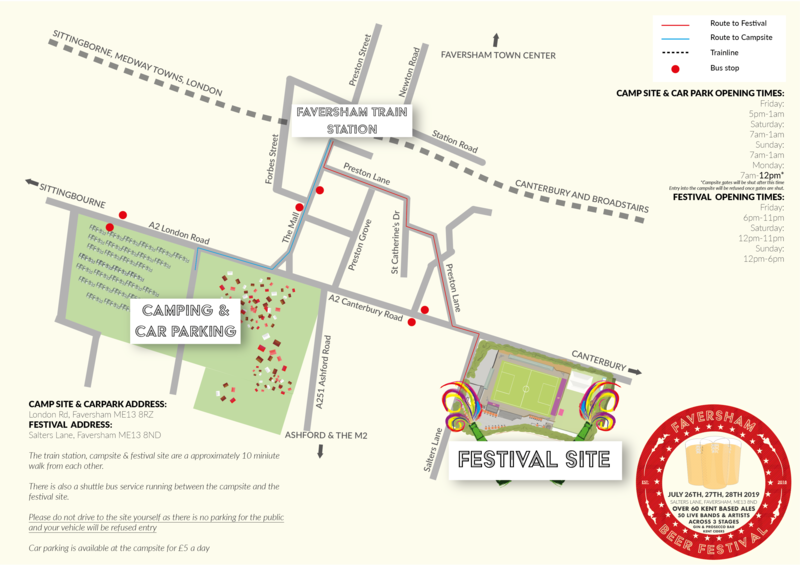 Car parking will also be run in the same area but parking next to tents is not allowed. All cars must be parked in the car parking area. Use of Motorhomes and Campervans are permitted and will be located in the car park to allow people to leave and come back to site without causing any issues in the campsite. Campfires/ disposable BBQs are not permitted on the campsite or carpark. Dogs are not permitted on the campsite or carpark. Litter must be disposed in the bins provided or taken with you. The campsite gates first open at 5pm on Friday and close for good on Monday at 12pm, entrance will only be permitted with a valid ticket or wristband. The Campsite gate will be shut at 1am each night however access on foot is always available. Glass bottle are not permitted on site. Any one caught using or selling illicit drugs and substances will be ejected from the site and reported to the authorities.